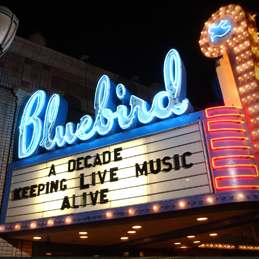 The curvy-lettered, bright-blue neon marquee suggests a tiny, intimate club, but the Bluebird is actually a full-sized (400 capacity) room with a great balcony space. Built in 1913, then drastically renovated in the mid-Nineties, the Bluebird (at 3317 E. Colfax Avenue) regularly grabs rising stars like Japandroids, leaving bigger names to the larger Fillmore and Ogden theatres down the street. Fun Fact: The theater was featured in the 1995 movie Things to Do in Denver When You're Dead. Myxed Up Creations is a Colorado owned and operated retail & wholesale company founded in 1992. They pride ourselves on top quality in the products that they sell and in the service they provide. Their main goal is to guarantee complete customer satisfaction through the total Myxed Up experience. Founded in 1992 as a shoestring operation with no capital backing, Myxed Up Creations began with a small line of hand-crated FIMO clay products, catering to students at Colorado State University. As their product line increased so did their customer base. In 1994 the Myxed Up Creations Factory Outlet opened at 5800 East Colfax in Denver, CO. The Factory was geared for wholesale manufacturing of FIMO creations, but a small part of the factory was reserved for a retail outlet of Myxed Up products. Interest in the products began to grow as the word got out at such venues as The Taste of Colorado and The People’s Fair (two festivals held at the beginning and the end of the summer in downtown Denver). Combined with radio advertising, sales at their retail outlet increased along with a demand for a wider range of products. During this growth at a retail level, their wholesale manufacturing was expanding, and their FIMO products were featured in over 600 stores nationwide. Over the next few years their wholesale business grew by over 2,000 outlets. They also moved their retail outlet two doors down to a 1200 square foot facility. Today, the company is an established and well-regarded retailer on East Colfax Avenue with interest in the Colfax Renewal Plan. In the spring of 2010 they opened our 5,000 sq ft super store on Colfax Avenue. Their product line has increased from an initial eight to over 10,000 items including jewelry, clothing, posters, stickers, incense, candles, and other products geared to their trade-mark product – the unique hand-crafted FIMO clay beads. They have also concentrated on delivering a superior brand of customer service. King of Colfax from dustmitefilms on Vimeo. The King of Colfax was a 20 mile underground / unsanctioned bicycle race held by Denver Chain Chase last month. 54 cyclists showed up to race from a little west of Colfax on Simms St. (in Golden) all the way to Colfax and Dayton in Aurora. They then turned around and finished in Civic Center Park. 1st place finished the race in 47 minutes, which is an average of about 25 mph. Denver Chain Chase actually host about 8-10 unsanctioned races in Denver per year! They WILL be doing a KING OF COLFAX 2 next year also! Join them for their upcoming grand opening party! 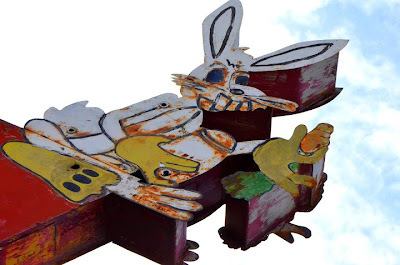 Colfax Avenue boasts many obvious retail charms, from perennial favorites like the Tattered Cover and Twist & Shout to a revolving ragtag revue of cupcake bakeries, comic-book stores, coffeehouses and stores that sell collectible toys. But on down the road to the east, in downtown Aurora, the Collection Studio brings new life to a building donated by Troy Gladwell of Medici Communities. The consignment gallery, run by the Aurora Cultural Arts District (which shares the space), benefits both the non-profit organization and the Colorado artists who show work there, bringing a much-needed cultural edge to the Aurora corridor. "If I stay here, I won't be able to even help me," Persinger said, who is now 18 years old. "I knew I had to get out and do something and make something out of myself." Much of her life has been spent surviving the reality of Colfax Avenue. "There were drug dealers and prostitutes and whatever because that's what happens on Colfax," Persinger said. "I knew a couple of girls that were 12 and 13 and they were prostituting and I didn't understand." She has been living for years in a motel on East Colfax in a single room with her grandparents. "Yeah, she is a tough and maybe she got a little bit of that toughness from living right here," Persinger's grandmother Linda Jordan said. Persinger says it's that toughness and determination that's driving her down a different path. She decided she wanted break out of the Colfax cycle by going to college. "Most people in this situation aren't going to college, they're not graduating," Persinger said. "You're lucky if they're even in school." She buckled down and got strong grades at George Washington High School. But, she did not know the process of applying to college let alone how she was going to pay for it all. "No one in my family has been to college, so we were wondering what we were supposed to do," Persinger said. She received help from an unlikely ally - the family who adopted her daughter. "If it weren't for them, I wouldn't be going to college, most likely," Persinger said. "They didn't have to [care], but they do and that means so much. I don't even know where to begin." The adoptive family wanted to remain anonymous for reasons of privacy. But, they hired an advisor over the period of nearly a year to help Persinger apply to college, obtain scholarships, and figure out a way to pay her tuition. "It's just amazing," said Tara Persinger, Briauna's mother who now works as the manager of the hotel where they live. "She found the right family." The family also had connections to a small, all-women's college in Nevada, Missouri. They helped Persinger get into Cottey College where she is now attending. Persinger says it is quite different than what she is used to. "So, I'm here and I'm like, there's a lot of space here and I can walk around outside and not worry about someone trying to pick me up," Persinger said. She doesn't worry about her next meal. She is surrounded by friends instead of drug dealers and pimps. Persinger still can't believe she is living in a small town going to college. "A year ago I would've never thought of all the places, I would be in the middle of Missouri," Persinger said. Persinger wants to be a pharmacist. She plans on having a successful career and make enough money to get entire family away from the troubles in Colfax Avenue. "You don't want to get stuck in this. You want to start out and just keep going because once you get in, it doesn't matter how old you are. It's hard to get back out," Tara Persinger said. Briauna Persinger finally feels like she's starting to leave her life on Colfax Avenue behind. "I definitely don't miss Colfax any part of it," Briauna Persinger said. "I hated that street." SOUTH BEND, INDIANA -- On the day when he would have turned 190, about 40 people gathered Saturday where Schuyler Colfax once lived, at 601 W. Colfax Ave., and spoke of his role to end slavery and uplift civil rights. "He's sort of our (Abraham) Lincoln," said Tony Flores, president of the local AFL-CIO union. "Without Colfax," Melvin Reed said, "we don't have Martin Luther King." The group stood at the former home, which long ago was torn down and now is the Berean Seventh-day Adventist Church, and spoke of a man who served in the U.S. House of Representatives, where he voted for and influenced the 13th, 14th and 15th amendments, and who also became the country's 17th vice president. It was the first observance of Schuyler Colfax Day, created by the South Bend Common Council in January to preserve his memory. The day also revealed what's missing. "I've come to know him quite well," said Ann Leonard, a history buff who's made it her hobby to study Colfax over the past 25 years, collecting about 800 letters to and from him. She's picked up copies of the letters in her travels, including a visit to a man who'd written a biography of Colfax, and turned her research into articles. The group drove to the City Cemetery to continue the ceremonies, where the Daughters of the American Revolution noted a piece of Colfax that's gone neglected. "This is a disgrace," said Carol Nichols, an officer with the Schuyler Colfax Chapter of the DAR, pointing out where Colfax's bones rest. "This is our vice president. We need some new stones." A small rectangular headstone for Colfax, with all letters eroded to flat nothing, sits lined up with similar stones for his family -- also weathered into anonymity. There lies his son, Schuyler Colfax Jr., who'd become South Bend's mayor, along with Colfax's two wives (he married again after one had died), his mother and his daughters. Oliver Davis, the city council member who introduced the resolution that created Schuyler Colfax Day and who presided over the ceremonies, nodded as he listened to Nichols. As events came to a close, he told the crowd: "We do need to fix up this area. In honoring history, we really have to do a better job." The Colfax Chapter of the DAR is raising money to restore the Colfax grave monuments, including a larger one that was added later. So far, the fund has just $379, Nichols said. "We are frantically trying to find what the top of his (larger) monument looked like, because it was broken off," said Glenda Erskin, the regent or head of the chapter. An angel on top is not original, and no one yet has found a picture of what the monument had looked like. Colfax goes beyond just the namesake of this DAR chapter, which formed in 1911 and has 152 members. "We have quizzes (on Colfax history) to be sure the ladies are staying on top of it," Erskin said. Members of St. Joseph Lodge 45 of the Free Masons conducted a brief ceremony at the grave. Colfax belonged to that lodge. 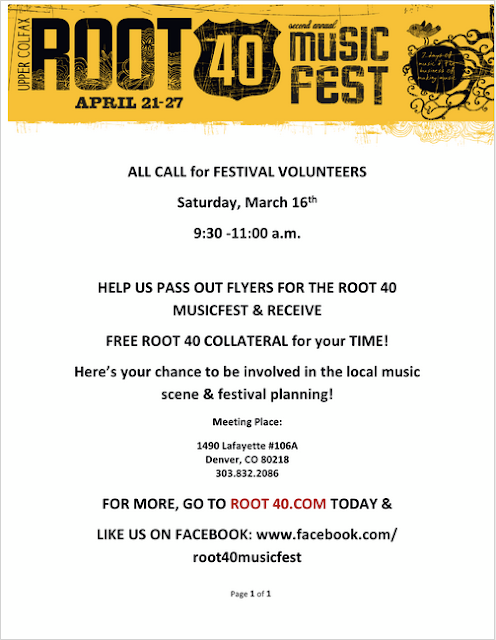 (Denver, CO) – The Stanley Film Festival (SFF) announced today its call for volunteers for the inaugural four-day event that will run May 2 – 5, 2013 in Estes Park, Colo. Celebrating the best in independent horror cinema, it will showcase a full slate of films, panels, student competitions, audience awards and receptions – all at the beautiful and historic Stanley Hotel. Aside from its local reputation as a haunted landmark spanning many years, the Stanley Hotel served as Stephen King’s inspirational Overlook Hotel in The Shining and is where the majority of the Festival will take place. As an essential component to the success of this first-year festival, SFF is seeking dedicated and energetic film lovers to fill positions across five departments: Customer Service & Guest Relations, Hospitality Lounge, Special Events, Theater Operations & Production and Transportation. SFF volunteers are required to commit 15 hours at minimum and will receive a festival volunteer pass giving access to screenings plus an official volunteer t-shirt. Details about the SFF volunteer program including department descriptions are available at stanleyfilmfest.com/volunteer. SFF has also announced its official kick-off party on Wednesday, March 27 (5:30 pm) at the Sie FilmCenter (2510 E. Colfax Avenue) in Denver. Open to the public, this free event will highlight the festival program, information about SFF and offer a pre-release screening (7:30 pm) of a soon to be announced horror film. The Denver Film Society will generously provide complimentary drinks in Henderson's Lounge. For local attendees without a need for lodging, individual passes to attend SFF are now available. Packages to attend the Stanley Film Festival are also sale and include lodging at the Stanley Hotel. All purchase options are available online <http://stanleyhotel.us4.list-manage.com/track/click?u=18cb34213bf59da9e7d3e3978&id=722b0fffcf&e=1e9bc75af6> . • March 27: SFF Kick-off Party at the Sie FilmCenter in Denver, Colo.
• April 1: Full program announced. • April 5: Press accreditation closes. • April 8: Individual tickets on sale to the public. Stanley Film Festival: The Stanley Film Festival showcases classic and contemporary independent horror cinema all set at the haunted and historic Stanley Hotel in beautiful Estes Park, Colorado. The Festival presets emerging and established filmmakers, enabling the industry and general public to experience the power of storytelling through genre cinema. Founded in 2013 by the Stanley Hotel to celebrate the property’s iconic Hollywood heritage, the four-day event showcases filmmakers latest works, Q&A discussions, industry panels, the “Stanley Dean’s Cup” student film competition and special events for cinema insiders, enthusiasts and fellow artists. The 40 West Arts District showcases what happens when vision, investment, and community and civic leadership converge. Just over three years ago, the idea of an arts district was a fledgling thought suggested during a community planning meeting for the Lamar Street Station Area Plan as a way to revitalize an older, eclectic neighborhood and commercial corridor. Because of the strong partnership between the Two Creeks neighborhood, Metro West Housing Solutions (formerly Lakewood Housing Authority), the Lakewood – West Colfax Business Improvement District, the West Colfax Community Association, the Rocky Mountain College of Art + Design, and the City of Lakewood, the vision became reality. 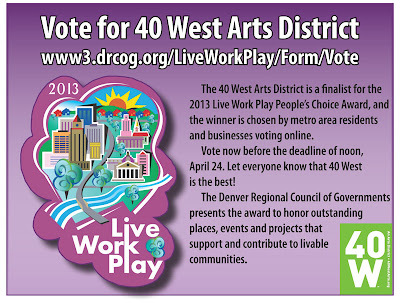 The 40 West Arts District formed as a non-profit and was named an Emerging Creative District by the State of Colorado. The City of Lakewood received a 2012 Gold DRCOG Local Government Award for the 40 West Arts District and related collaborative planning efforts. Since forming, the 40 West Arts District has held a number of highly successful events including INSPIRE! Lakewood’s Arts Week, The 40 West Arts RIOT, the Arts Along Colfax Program, and the 40 West Arts Fall Festival. • A 160-unit mixed-income housing project is being constructed by Metro West Housing Solutions, just steps from the Lamar Street station. • New mixed-use zoning has been adopted to promote high-density residential, retail, live/work units, and art studios. • The 40 West Arts District Urban Design and Mobility Concepts Plan was adopted as an amendment to the Lakewood Comprehensive Plan to further promote and enhance the Lamar Street landscape experience and to redefine the West Colfax Avenue corridor. • Funding has been secured, and plans are underway, to construct a traffic-calming roundabout in the intersection of West 14th Ave. and Lamar Street and to construct an eight-foot sidewalk from Lamar Station to West 14th Ave. The sidewalk will include an enhanced amenity zone to implement the vision of the Lamar Street Station Area Plan and the 40 West Urban Design and Mobility Plan. • A Sustainable Neighborhood Assessment grant, funded through the Environmental Protection Agency, was received, which provided recommendations for sustainable re-development in the 40 West Arts District neighborhood. The 40 West Arts District encompasses the area within approximately ½ mile of the Lamar Street Station, on the W Rail Line, opening in April 2013. It includes the Two Creeks neighborhood, the commercial corridor of West Colfax Avenue, and the Rocky Mountain College of Art + Design. 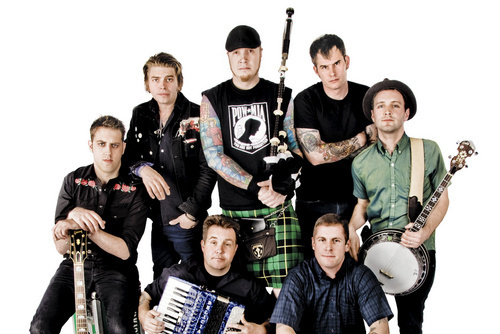 Live Nation and Soda Jerk are pleased to present DROPKICK MURPHYS at The Fillmore Auditorium on Wednesday, May 29. A Special Guest TBA will open the show. SIGNED and SEALED in BLOOD is taking the band, over a decade into their career, to places they’ve never been before. Their holiday song “The Season’s Upon Us” saw the band breaking through Modern Rock radio, charting higher than they’ve ever been before. 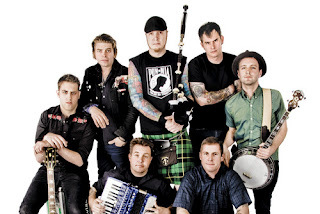 The band were featured in a recent issue of Billboard Magazine, and on New Year’s Day the band was featured on NPR’s widely listened to “All Things Considered” (http://www.npr.org/2013/01/01/168406178/the-dropkick-murphys-a-rose-tattoo-tells-a-life-story). Also, Ken Casey of the band was invited by Bruce Springsteen to sing a song in his MusiCares tribute concert during GRAMMY week. Tickets are $32.50 GA plus applicable service charges. Fast Geek Press will be celebrating the release of a new poetry book called “Denver” by Ken Arkind and illustrated by Charly Fasano by holding two events in Denver, Colorado on Friday, March 29 and Saturday, March, 30, 2013. On Friday, March 29, 2013 at 7:00 PM. 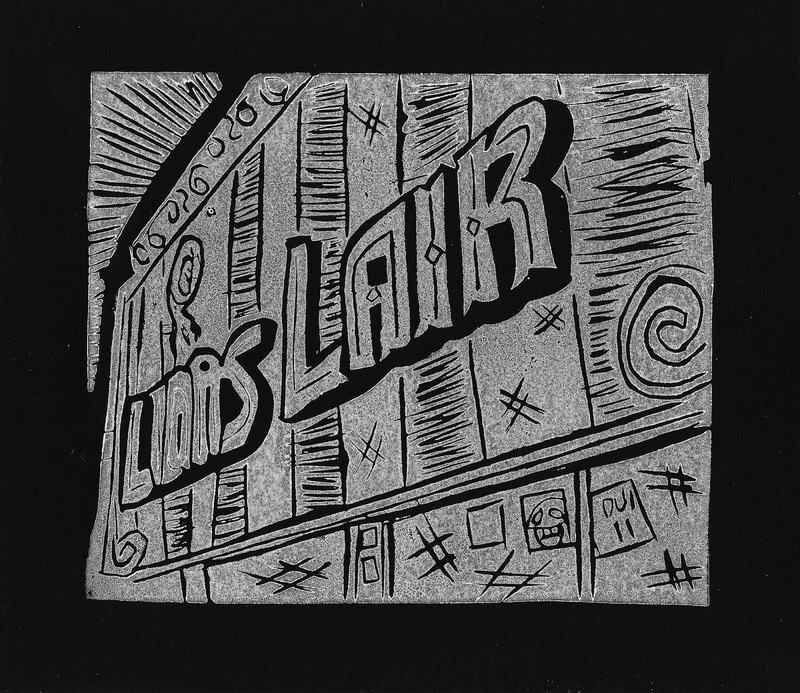 Fast Geek Press presents a multimedia art show of linocut block prints on stretched canvas, poetry and films by Charly Fasano at The Fast Geek Boutique (321 W. 11th Ave. Denver, CO). 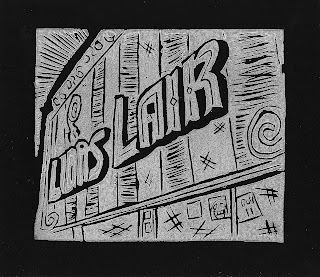 All the illustrations from “Denver” will be on display as well as series of linocut prints based on Lucha Libre Wrestling, drunken squirrel hunting and bowling at the Fireside Bowl in Chicago, Illinois. On Saturday, March 30, 2013 at 8:00 PM Fast Geek Press presents “Denver” by Ken Arkind Book Release Party at The Deer Pile (206 E. 13th Ave, Denver, CO). 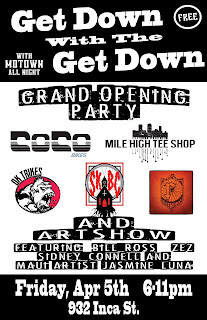 This event will feature poetry readings by Ken Arkind and Charly the city mouse Fasano, Denver Minor Disturbance featuring Jozer and music by Hindershot. Donations accepted. Ken Arkind is an American National Poetry Slam Champion, Tedx Fellow, Nuyorican Poets Cafe Grand Slam Champion and published poet who has performed his work in 49 States, 6 countries and at over 150 colleges and universities. He is the current Executive Director and head coach of Denver Minor Disturbance, an independent literary arts organization dedicated to helping Colorado youth find voice through the mediums of poetry and performance. 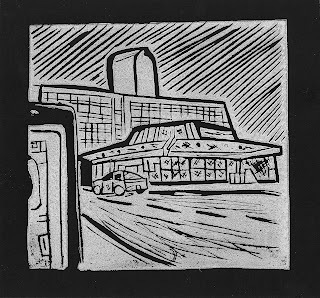 Charly “the city mouse” Fasano is a poet, block printer, and filmmaker from Ithaca, NY, via Denver, Colorado. He is the founder of Fast Geek Press, Pretend You Can Reab audio zine, and As Well As Magazine. He has released a vinyl ep, a CD, two cassette tapes and four books of poems. 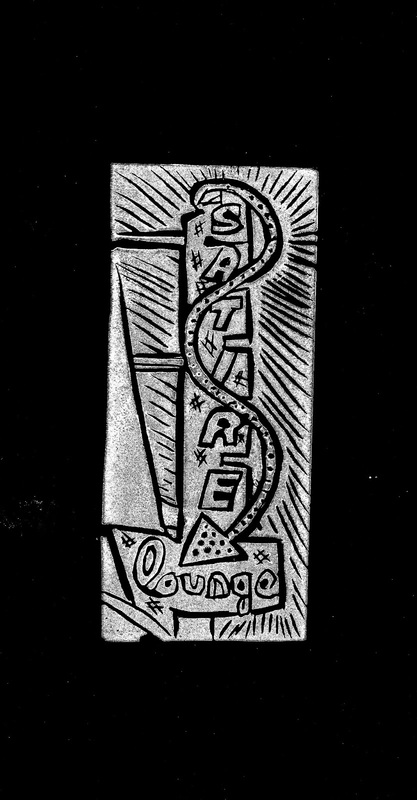 Fasano’s poems have appeared in Yellow Rake Zine, Lubricated Magazine, Growing Strange Magazine, This Ain’t No Cowtown Compilation: Number Two and ColfaxAvenue.com's Compilation Vol. 1. His films and music videos have appeared at prickofthespindle.com, movingpoems.com, Westword.com and The Onion’s AV Club online. 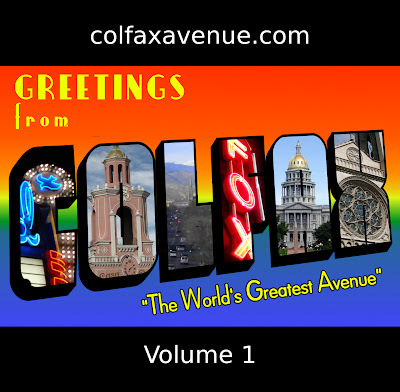 How fitting that the ColfaxAvenue.com Compilation CD Vol. 1 is finally in stores the day the movie "On The Road" hits theaters in Denver! 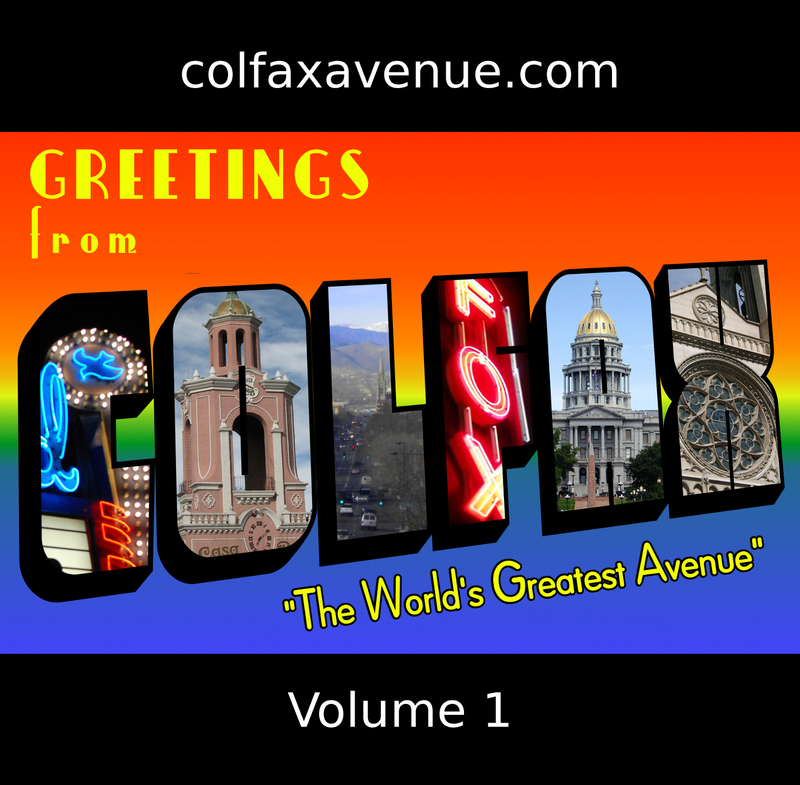 The CD features fifteen all original songs about Colfax Avenue, written and performed by Colorado Bands. 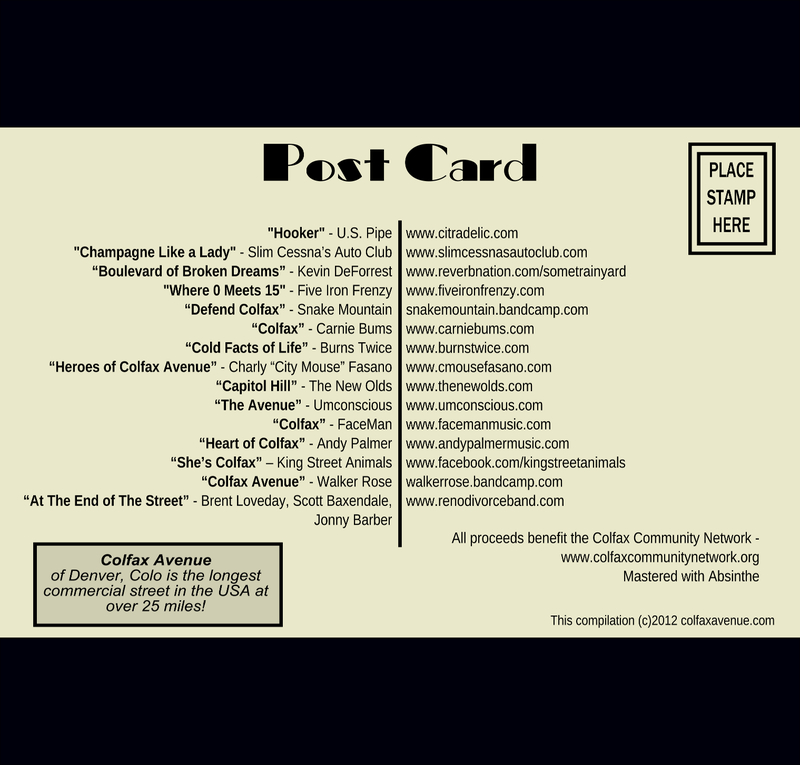 All proceeds from the sale of the CD's are going to benefit the Colfax Community Network, an organization dedicated to helping homeless families find food and shelter. Please do your part and pick up a copy of the CD today at Twist and Shout! Thanks!! Pick up a copy today at Twist & Shout on Colfax Avenue! Prince coming to The Ogden Theatre! Prince in Denver at the Ogden Theatre! Four shows! On sale right now at Axs.com and OgdenTheatre.net! Get your tickets before it sells out! His royal highness, who hasn't been here since 2004, is playing at the Ogden Theatre on Sunday, May 12, and Monday, May 13. He'll be playing two shows each night, one at 8 p.m. and one at 11 p.m. Tickets are $250 which is pricey, yes, but he hasn't appeared in a venue that small in Denver in my lifetime, so if you're a fan it will be worth it. The pop legend will be playing with his all-ladies band, 3rdEyeGirl. Colfax Avenue is part of U.S. Route 40. Some people believe that U.S. Route 40 obtained its numerical designation because it approximated the 40th parallel latitude line. This is incorrect. Route 40's proximity to the 40th parallel is merely coincidence. Highway numbering would increase southerly and westerly. East-west transcontinental highways would be numbered in multiples of ten. North-south transcontinental highways would be numbered ending in five. Three digit numbered highways would be spurs off a two digit numbered highway -- and the tens and unit digits would be the same as the highway from which they spurred. If east-west transcontinental highways obtained their designation based on their latitude, all of our east-west highways would be numbered 30-48. To further contradict the latitude myth, the numbering increases as you move south; latitude increases as you move north. Nonetheless, given the numbering convention, one of the highways would come close to matching its respective latitude number. It turns out that Route 40 is that road. It was nothing special, just numerical coincidence. By the way, the National Road was petitioned to have the designation U.S. Route 1. However the highway administration overseeing the numbering saw this as a violation of their convention and wisely rejected the proposal. The highway administration sought to maintain a consistent numbering convention. Here's another coincidence - Route 40 crosses the 40th parallel four time: 1) Brownsville, Pennsylvania, 2) Cambridge, Ohio, 3) Granby, Colorado and 4) Lovelock, Nevada. 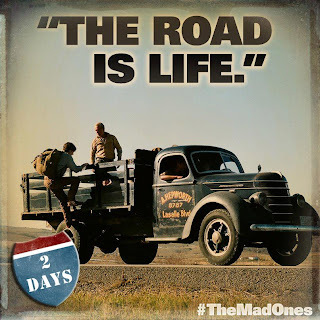 On The Road - The Movie - Starts Friday! As a native Denverite, one of the joys of growing up was riding on the streetcar. The cars were big, lumbering and painted bright yellow as they ran on wired electric overhead lines and on tracks that covered many of the major Denver streets. For 25 cents, the motormen (as they were then known) would give you three tokens for three rides, or you could ride for 10 cents. The motormen would also issue punched yellow transfer slips upon request, and you could ride out to Denver University to see the football games, or ride to the end of the line. The seats were made of woven, yellow wicker rattan with brass-loop grip bars on each inside edge for passengers to hold on to, in case they had to stand. In the winter we would try to sit above the heater boxes located in the middle of the car, and during the summer, we would slide the windows all the way down. 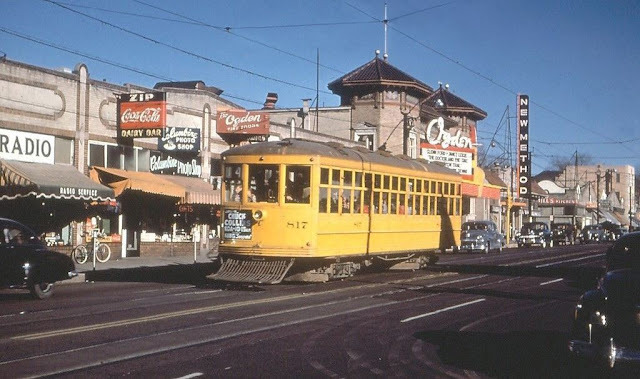 One of the Denver Tramway Company's streetcars takes a final run in the early 1950s. I can still hear the resonant voice of the motor-man calling out the names of streets we passed as I rode down Colfax on my way to school. The clang of the streetcar bell could be heard two blocks away, when he rang it to warn cars or people off the tracks. You never had to wait very long for a ride, as they came along every few minutes, and the end of the line was the famous Loop along 15th Street between Arapahoe and Lawrence Streets, where "meeting at the Loop" was a Denver tradition. 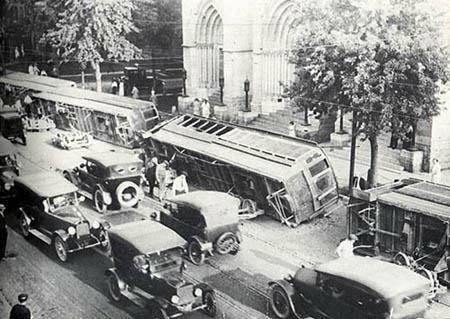 The streetcars were halted briefly only three times during their long-running career. 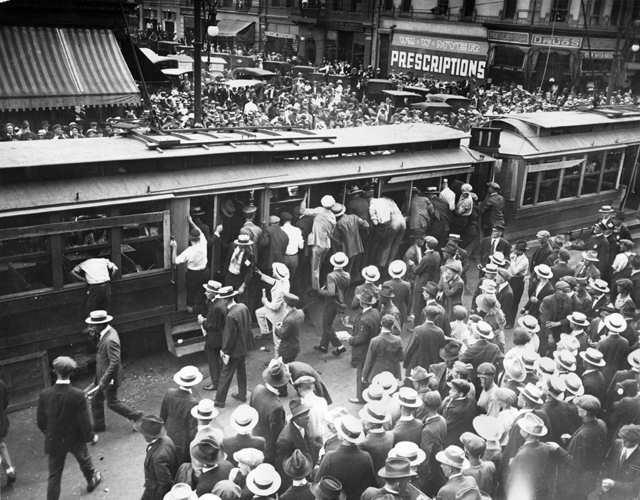 The first was a short-lived union strike in 1920, and the other two were due to blizzards in 1913 and 1943. Cynthia Draper is a freelance writer living in Littleton. She has written for local newspapers and travel magazines. Welcome Weisco Motorcars to East Colfax! Join us in welcoming Weisco Motorcars to East Colfax for a special grand opening and fundraising event on Wednesday, March 20. The celebration, at Weisco's new location at 7000 E. Colfax Avenue includes a Colfax photo show and wine tasting from Mayfair Liquors and their amazing vendors. The wines tasted during the evening will be available to pre-order, and can be picked up and paid for once assembled, at Mayfair Liquors. The best part? 20% of wine sales from the event, as well as proceeds from ticket sales, will be donated to Colfax revitalization programs! A limited number of tickets are available for sale so make your purchase today! Lakewood, Denver and Aurora's Colfax business development organizations have joined forces with 40 West Arts to produce a touring photography exhibition, "Traveling Route 40 - Celebrating the Character of Colfax Avenue." 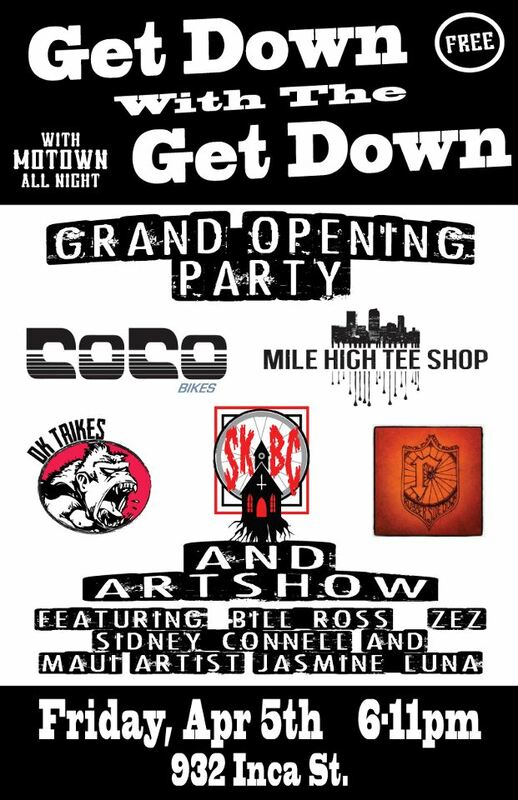 The show coincides with Denver's 2013 Month of Photography celebration, and is the latest collaboration of Colfax organizations to elevate public awareness and appreciation of the rich history of America's longest commercial street. 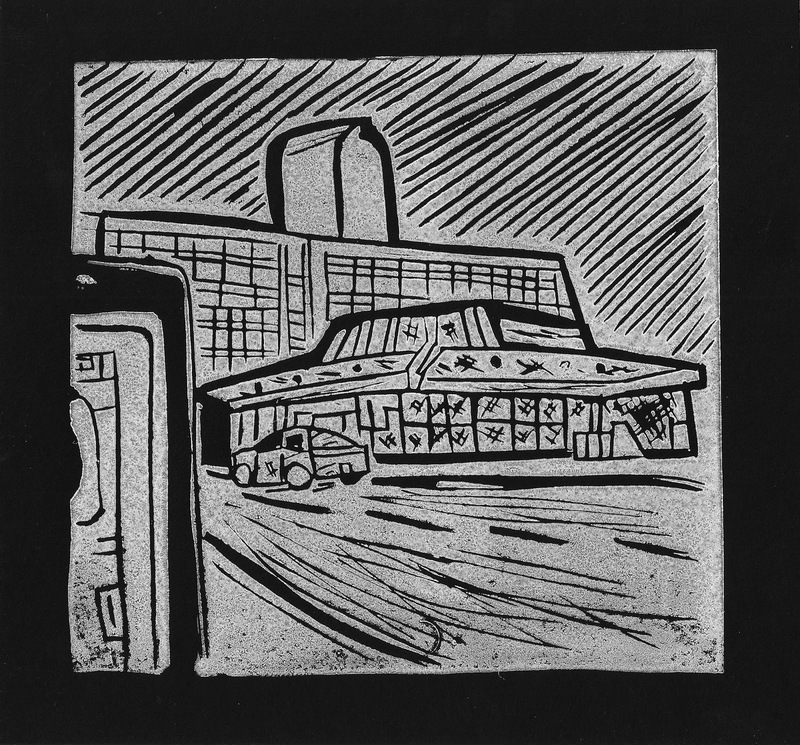 The juried exhibition will also be featured at the McNichols Building in Civic Center Park throughout March and April 2013. In addition, a traveling show will be featured at select venues in each of the participating Colfax business districts. The show will be available for public viewing at Weisco from March 20-23. John Kernan Mullen, born in Ballinasloe, County Galway, Ireland in 1838 became one of Denver's most generous philanthropists. He immigrated to Oriskany Falls, NY with his parents in 1847, at the age of nine, and took his first job working in a flour mill. By age twenty, Mullen moved west to Denver, leased a flour mill, then soon bought several more. By 1911, he established Colorado Milling and Elevator Company, built the state's first grain elevator and went on to operate 91 elevators, warehouses and mills in Colorado, Kansas, Utah and Oregon. Mullen was convinced that his wealth was meant to be used to help others and he ultimately spent much of his fortune on libraries, high schools, churches and other causes to benefit the public. The most prominent church Mullen assisted financially to construct was the Cathedral of the Immaculate Conception (1860) on Colfax Avenue and Logan. Vintage Theatre Productions announces the addition of a classic movie series! Screenings will run the third Sunday of each month at 6:30 p.m. at Vintage Theatre, 1468 Dayton St. in Aurora. A suggested donation for the evening is $8 adult and $5 for 18 and under. 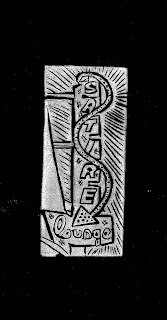 Call 303-856-7830 or online at www.vintagetheatre.com. 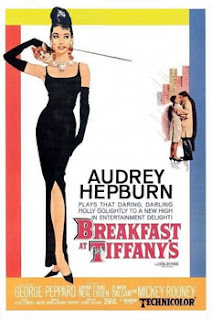 Breakfast at Tiffany's is a 1961 romantic comedy film starring Audrey Hepburn and George Peppard, and featuring Patricia Neal, Buddy Ebsen, Martin Balsam, and Mickey Rooney. The film was directed by Blake Edwards and released by Paramount Pictures. Hepburn's portrayal of Holly Golightly as the naïve, eccentric café society girl is generally considered to be the actress' most memorable and identifiable role. She herself regarded it as one of her most challenging roles, since she was an introvert required to play an extrovert. Hepburn's performance of "Moon River" helped composer Henry Mancini and lyricist Johnny Mercer win an Oscar for Best Song. Truman Capote had originally picked Marilyn Monroe to play the role of Holly Golightly but Paramount instead chose the waifish Audrey Hepburn to play the part. In 2012, the film was added to the National Film Registry. "The fear that war may blow civilization to smithereens loses some of its sting when you see Denver’s Colfax Avenue." 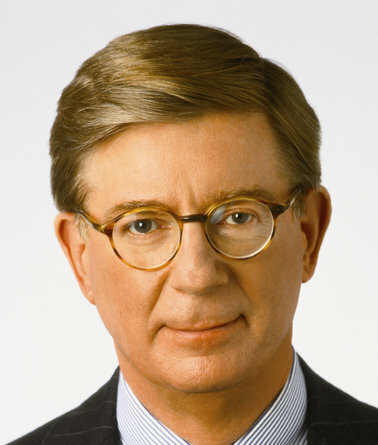 - George Will, 1978. 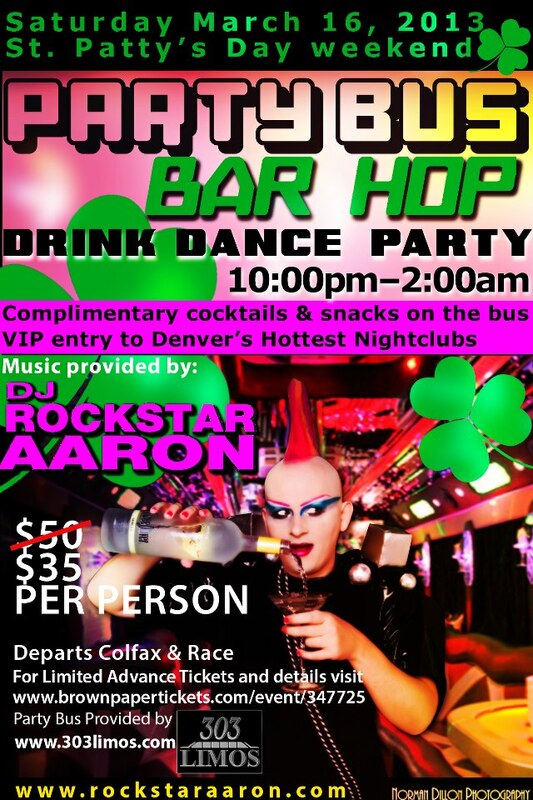 Rockstar Aaron Drink Dance Party! White smoke billowed from the Sistine Chapel chimney shortly after 1800 GMT, signalling the election of a new Pope. Cardinal Bergoglio of Argentina has been elected as the new head of the Catholic Church. Crowds in Vatican City cheered and bells rang out as the announcement was made on the balcony of St Peter's Basilica. He will replace Pope Benedict XVI, who stepped down last month saying he was no longer strong enough to lead the Church. 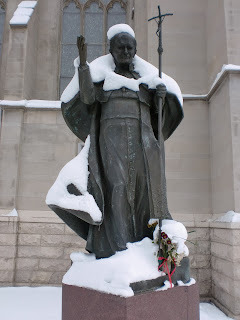 Pope Francis (as he has chosen to be called) wore an unadorned white robe as the announcement was made, as a blanket a fresh snow adorned a statue at the Basilica of the Immaculate Conception on Colfax Avenue this morning. Pope Francis, 76, is the first of that name and the first Jesuit to be elected leader of the Roman Catholic Church. Denver Tramway Company workers overturned tram cars during a 1920 strike in front of the Cathedral of the Immaculate Conception at Colfax Avenue and Logan Street. 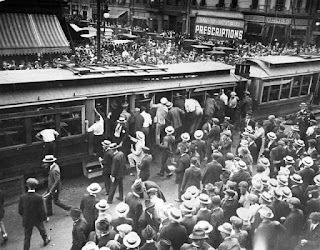 On Colorado Day, August 1st, 1920, Denver Tramway workers went on strike for better pay. 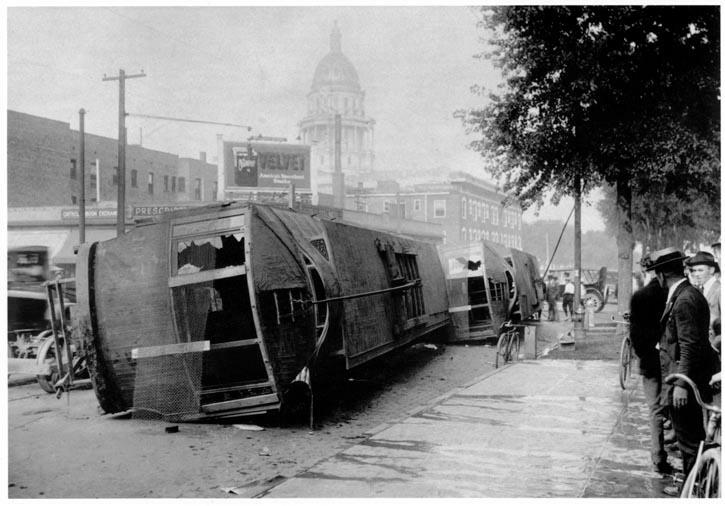 On August 5th, rioters overturned five tram cars on Colfax, then went on to cause other damage and vandalism around the city. The National Guard had to be called in to restore order. The first meeting to conceptualize Athena Project and the Festival took place in May of 2011. Now, nearly two years later, Founder and Executive Producer Angela Astle's vision has become a reality. 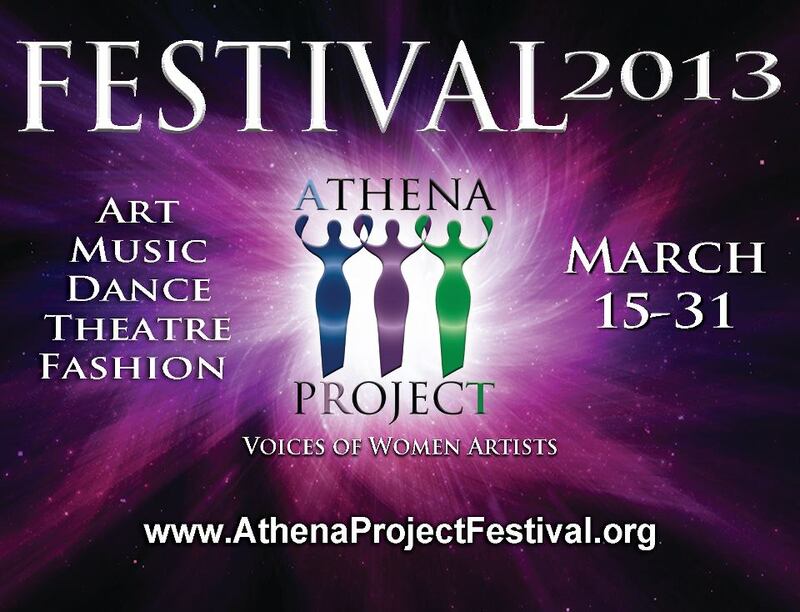 Athena Project is a professional group of artists dedicated to supporting and expanding women’s artistic contributions to the Denver stage and the wider community. Premiering the first ever production of this beautiful and heart-wrenching play. Synopsis: Tell Martha Not to Moan takes place in a family home in Detroit, 2007. As the presidential election campaign plays out on the national stage and the 40th Commemoration of the Detroit Riot is marked, a series of memories takes us on a unique and personal journey with a devoted and desolate elderly couple. With compelling dialogue and complex relationships, Tell Martha Not to Moan is a glimpse into the changing world as viewed from one African American home. Workshop productions of four new plays by women, called our Plays In Progress, or PIP, Series. Tickets are $10 for each play or you can buy a PIP Play Pass to see all 4 for $50 which includes a ticket to the World Premiere, Tell Martha Not to Moan. Dates: Open one hour before every evening performance of the Festival Events; also open an hour after matinee performances. Art pieces will be shown at The Collection from March 15 – April 26. All art chosen for the showcase will pertain to the theme of change and all artists will be women. Opening night reception on March 15 from 5-8pm. o Female choreographers will present dance pieces they have created at the Aurora Fox Studio. Though the dancers can be men, the choreographers must be women. The pieces may range from ballet to hip hop, lyrical to tap, and anything in between. Tickets are a flat $10. o We are pleased to showcase at least 4 short works-in-progress by the girls in our Girls’ Write Program. Girls’ Write is our youth playwriting program run in conjunction with Girls, Inc. This program provides underserved pre-teens and teens with role models in the arts who teach them how to write a play, and it helps to build future audiences and writers. There is a suggested donation of $10 for adults for this event and $5 for students. o During this evening, female musicians and/or songwriters will have the opportunity to play their music for all to hear at the Aurora Fox Studio. In addition, we hope to have musicians at The Collection gallery every hour that it is open. o We will present a Fashion Show of female designers celebrating the five elements and benefiting Athena Project. This event is co-sponsored by Three Little Birds Salon and Fashion Denver. 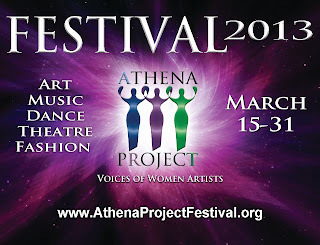 All tickets are on sale at www.athenaprojectfestival.org or by calling the Aurora Fox box office at 303-739-1970.